Squibs And Crackers: My House Is Naked! Last year John decided to fulfill his duty and hang our icicle Christmas lights on our house. This was a simple job in our single story home. But now that we had a new two story house with a very high roof, this simple job became a life altering experience for him. 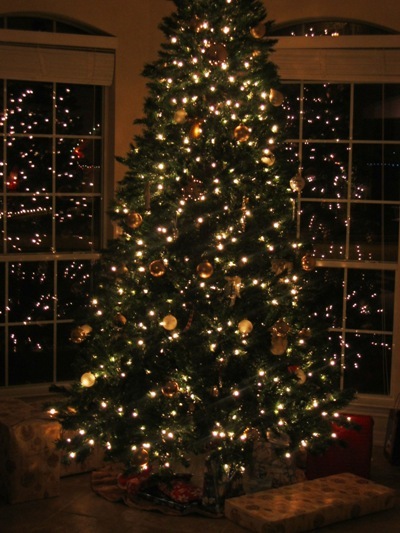 He borrowed the neighbor's sky-high ladder and climbed up with his arms full of twinkling lights. I believe he saw his life passing before his eyes because he hurried back down to reposition the ladder and asked me to hold it still. Unfortunately; in my 9 month pregnant state he decided I was not doing a good enough job that would ensure his safety to see his future child. He asked the 15 year old boy next door to help him instead. Several hours later we had a beautiful home with icicle lights adorning it. I guess John feared taking the lights down the same way he got them up. So, he just grabbed on the end of one of the strings and yanked real hard. Down came the lights in a heap. Fast forward a year, that heap is in another heap at the bottom of the trash bin. The good yank that brought the lights down broke the delicate bulbs. And here is our naked, light-less, house today. At least we have the trees. Oh, and we're now at $1,300 to fix the car. Anyone for $1,500? Oh gosh, Katrine! $1,300!!! Did you strangle someone when you heard that? How lucky that you guys are filthy rich! It'll be nice to pull some change out of your bursting-at-the-seams accounts to lighten the load. I bet ya'll have been trying to figure out what to do with all that dough anyways. Seriously, let us know if we can help you out...like you can send a kid to live with us or something (they do the dishes and laundry right?). 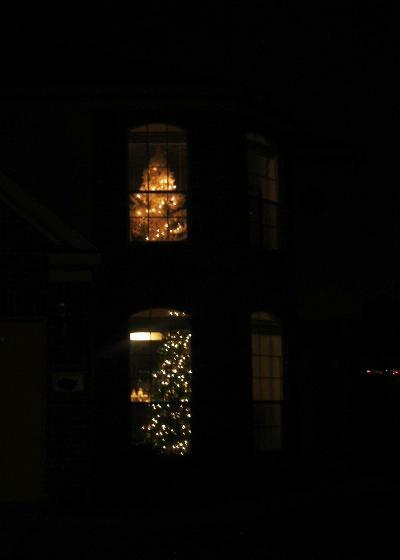 That's okay...Christmas lights are overrated! Better to have a nice big house with no lights than lights without a nice big house, right?! Ummmmm about sending a kid to live with Kira. NO WAY!! it's till my house. I am loving your tree and I am loving Maddie's tree in her princess tower. But lights are just lights. It's like you don't get to see changing leaf colors, and beautiful mountains like I do, So in Texas I am sure it's no big deal to not have lights either. You know i say this because i want you to come back to Utah, I want you to miss Utah. is it working? Well we just paid $1700 for our car...so yes I feel your pain. But I am disappointed about the Christmas lights, that was the one thing I was looking forward to....I might have to rethink this anti-Christmas lights family I am going to be moving in with..hmm.